Seamlessly communicate with instrument devices. The Sepasoft™ Instrument Interface Module will let you capture raw textual data from instrument type devices via serial, text files, OPC devices, and more, enabling you to parse out the meaningful values that can be saved to databases or passed to other systems. The Sepasoft™ Instrument Interface Module will let you capture raw textual data from instrument type devices via serial, text files, OPC devices and more, and enable you to parse out the meaningful values that can be saved to databases or passed along to other systems. The Instrument Interface Module provides a seamless solution in eliminating hundreds of lines of code and extracting only the meaningful values from devices connected to your SCADA system. The Instrument Interface Module can be used as a stand-alone module, but it also seamlessly collaborates with all other modules. The Sepasoft™ Instrument Interface Module is perfect for serial devices – such as analyzers, measurement gauges, barcode readers and many more – where values are sent when the operator presses the send button or a request is sent to the device to read the values. The serial support built into our Instrument Interface Module includes polling the device for new data, receiving unsolicited data from the device, or requesting the new data from the device based on any event. Our Instrument Interface Module gracefully handles timeouts and other communication issues that are common with serial communications and also includes the flexibility of controlling every byte sent or received using script. Parsing boxes define the values to be extracted from a serial device and converted to numeric values. Each parsing box finds the label configured for it, extracts and converts the value associated with the label. Some instruments only support passing data through the use of a file; our Instrument Interface Module makes this process easy. You can also read values from external software programs that only support passing data through the use of files. The format of the data can vary from a reports format, comma separated values (CSV), or a mixture of the two. At the core of the Instrument Interface Module is a powerful parsing engine. Beyond processing raw data from serial or text files, any textual data that can be read into either the client or server can be parsed into meaningful values. This opens up the door to collect data from a variety of sources in the most straightforward manner. An example is reading temperature and humidity from a device that exposes readings on a simple HTML web page. By using scripts, the HTML content can be read and then the temperature and humidity values can be extracted and converted to numeric values using the parsing engine. 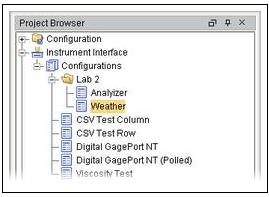 The Instrument Interface Module includes parsing templates that contain textual data with parsing boxes defining the values to be extracted and converted to numeric, date, or boolean values. Other types of parsing boxes allow extracting values at fixed locations, processing CSV columnar data, and processing CSV row-based data. A parse template can contain a mixture of any number of the different types of parsing boxes. 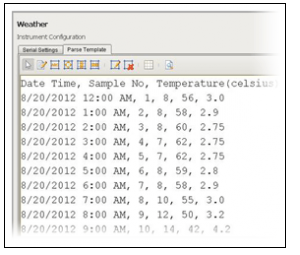 An example of the module’s columnar-based CSV parse template that extracts date, time, sample number, temperature, and humidity values and makes them available to be accessed in Ignition®. Because companies have many instruments of the same types, a central location to configure them will reduce the effort to reuse and maintain them. A configuration can be copied or modified to reduce the time required to set up communications with your unique device. 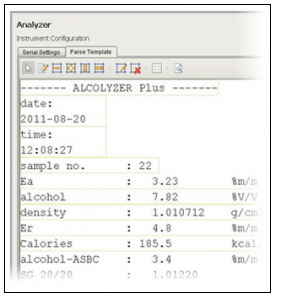 A built-in Instrument Interface Module allows for data collection from a large assortment of lab instruments. The project browser in the Ignition® Designer manages all instrument configurations in one central location, facilitating easy setup and maintenance.